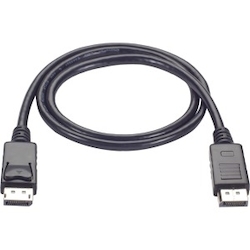 This DisplayPort 1.2 cable provides a dependable connection between your desktop or laptop computer and a monitor or projector. It can also be used with PCs, KVM switches, in digital signage applications and more. Additionally, this DisplayPort cable boasts gold-plated, latching connectors that provide outstanding conductivity and prevent unintended disconnections.